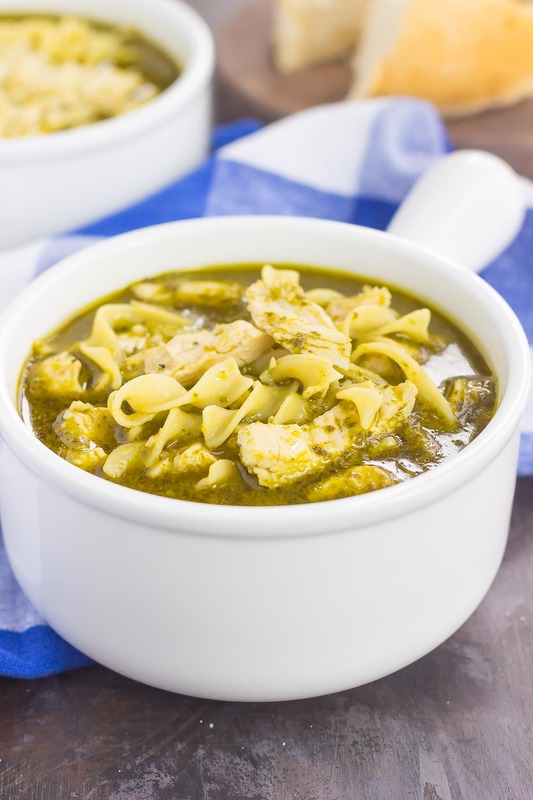 This Pesto Chicken Noodle Soup is made in one pot and ready in just 30 minutes! 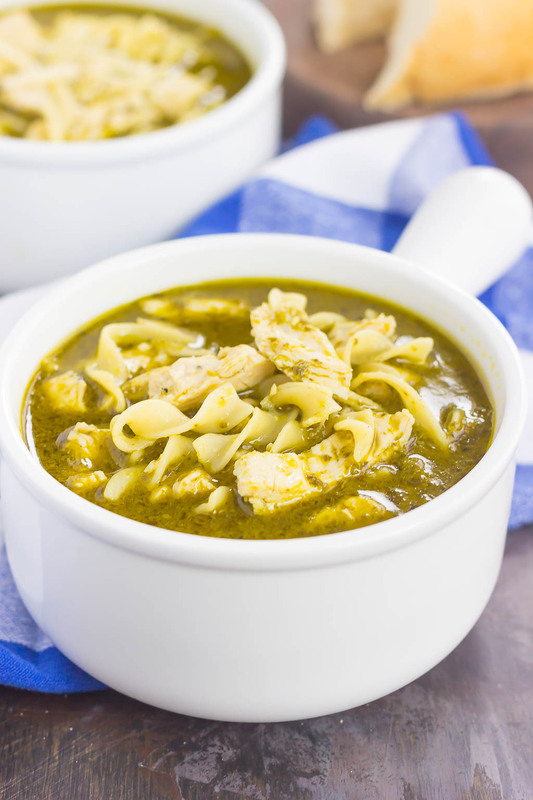 Filled with rotisserie chicken, tender noodles and enveloped in a simple pesto chicken broth, this easy dish is loaded with flavor and perfect for just about any time! How are you feeling now that February is here? Are you like me and can only envision the cold and snow never ending? That is, if you live where it’s cold and snowy, of course. I know it could be worse where I live, as Chicago does get cold and snow, but other parts of the U.S. and all over the world get it much worse. So I’m trying to look on the bright side. And that brings me to today’s latest and greatest creation, soup! If you’ve been hanging around here long enough, then you know that I am practically addicted to soup. I eat it when it’s blazing hot in the summer and usually eat at least one bowl a week throughout the year. It’s just that good, friends! And homemade soup is one of my favorite things to make. I love the versatility, endless combinations, and coziness that goes along with this dish. 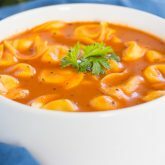 And you seem to like soup too, as this Easy Cream of Mushroom Soup and that One Pot Lasagna Soup have gotten rave reviews! I decided to get a little more creative today and took two of my favorite kitchen staples and combined them. This soup is nothing new, but for me, it’s a magical little bowl that gives me all the warm and cozy vibes. 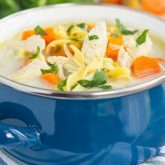 Chicken noodle soup has always been a favorite of mine for just about as long as I can remember. There’s just something about the simplicity and hearty taste that takes me back to my childhood. From snow days to sick days and everything in between, chicken noodle soup and I have always been friends. But, now that my tastebuds have evolved more, I love to experiment with this soup. 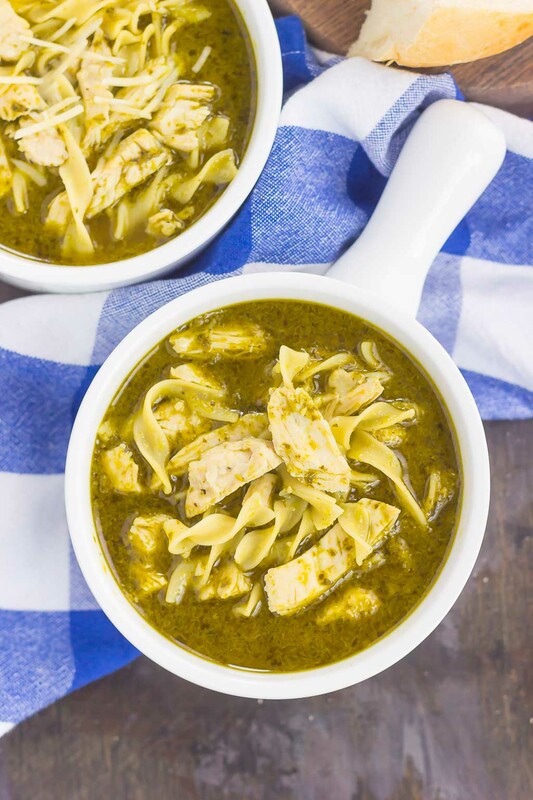 And that’s where this easy Pesto Chicken Noodle Soup comes in. The base is very similar to this recipe and makes it a breeze to whip up. If pesto sounds a bit strange to add to soup, trust me, you’re not alone. But, also trust me when I say that it’s so good, friends! 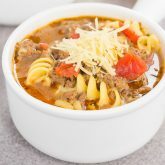 It gives this soup an extra dose of flavor, without being too overpowering. If you love pesto anything, then this soup was made for you. And the best part? It’s made in just one pot, with only six ingredients, and is ready in just 30 minutes. How about that for a cozy bowl of deliciousness? 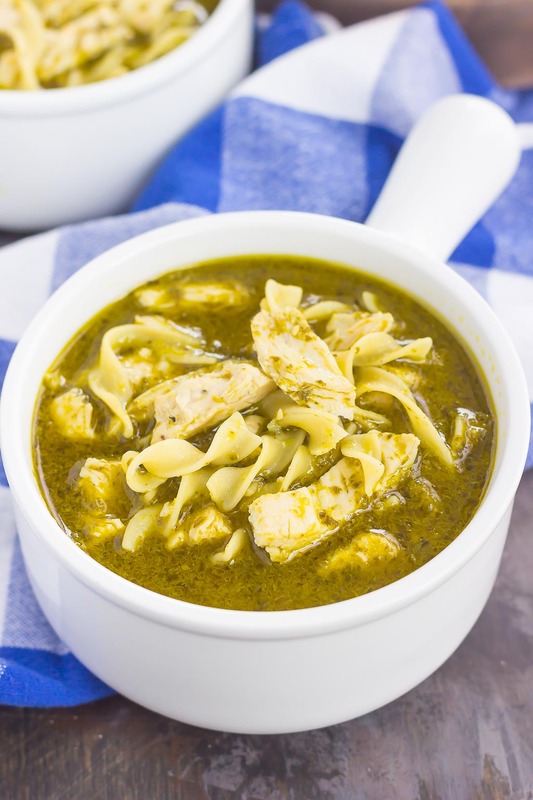 My tip for making this Pesto Chicken Soup is to use the already-shredded rotisserie chicken that you can find near the deli section of your grocery store. 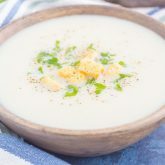 It’s such a time saver and makes this soup, and everything from salads, wraps, casseroles and more, so deliciously easy! 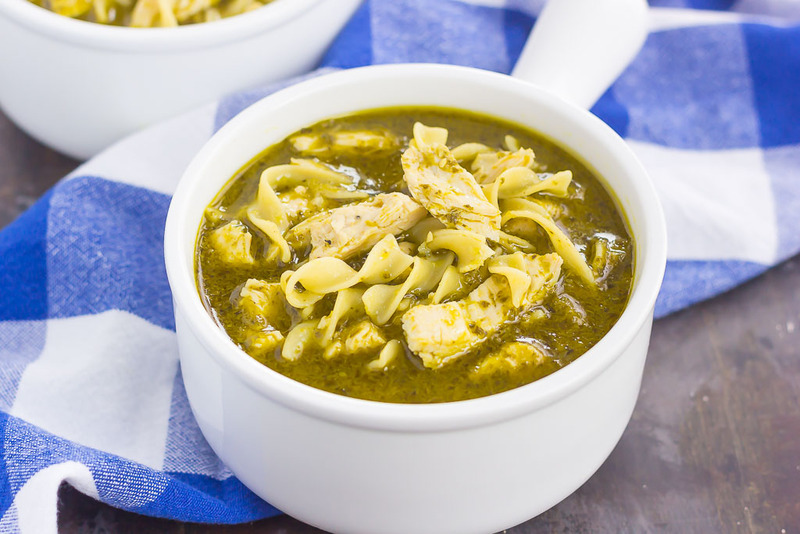 So if you’re a soup lover like I am, or if you’re just in need of a cozy bowl of comfort food to warm you up, I guarantee you’ll love the zesty flavor of this easy Pesto Chicken Noodle Soup! In a large soup pot, add chicken broth, bay leaf, dried thyme, salt, and pepper. Stir to combine and then cook over medium heat until boiling. Reduce heat, cover, and simmer for 10-12 minutes. Add shredded chicken and noodles to pot. Bring to a boil and then cook over low heat until noodles are tender, about 6-7 minutes. Stir in pesto and simmer for 2-3 minutes. Serve immediately with shredded Parmesan cheese, if desired. I used the already-shredded rotisserie chicken that you can find near the deli section of your grocery store.